Put this sign out in your yard to point the way to the egg hunt! Joy® Iron-on letters to spell "Bunny Crossing"
1. Cut board into two pieces, 10" and 14". 2. Sand the edges and paint with chalky finish paint. Edge with gray then dab paint with a paper towel to blur edges. Add smears of paint to the board with the paper towel. 3. Make a wash (paint thinned with water) with peony pink and paint letters. 4. Place letters on signs for spacing. Remove backing on letters and adhere to boards. Use an embossing heat gun to adhere letters to board. Glue the boards to a stake. Add a bunny to top of stake if desired. 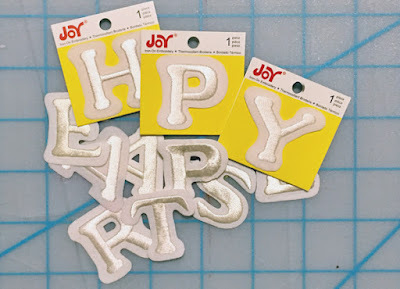 Look for a wide variety of Joy® Iron-on, embroidered letters at your local craft stores.